Gabbard had good reason to ask for proof. By his own account, Trump struck rapidly after seeing gruesome televised pictures of dying babies. No time was allowed for an independent investigation into the source of the chemical-weapons attack. No presentation was made to the United Nations or the Congress asking for permission to use force. Trump flipped his own policy on its head overnight, and began lobbing missiles. Here’s what Gabbard said: “This administration has acted recklessly without care or consideration of the dire consequences of the United States attack on Syria without waiting for the collection of evidence from the scene of the chemical poisoning.” Gabbard added she would support Assad’s prosecution and execution as a war criminal if the attacks were proven, though she still wouldn’t support military action. “A successful prosecution of Assad (at the International Criminal Court) will require collection of evidence from the scene of the incident, and I support the United Nation’s efforts in this regard. Without such evidence, a successful prosecution is impossible,” she said. But Tanden and Dean apparently agreed with Trump’s quick conclusion that “There can be no dispute that Syria used banned chemical weapons.” So did much of the mainstream media and foreign-policy establishment. Perhaps Assad was responsible, but skepticism is warranted in times of war. Assad’s forces are winning the war against their opponents; ISIS is in retreat. The Trump administration had recently reaffirmed its intention to focus on defeating ISIS, not on removing Assad. Increased US cooperation with Russia in that effort was looking more likely. Assad—along with the Russians and Americans and others—were dropping thousands of bombs in Syria with little international condemnation. Why would Assad endanger all of that with a brutal chemical-weapons attack on a target of no military value? Gabbard isn’t the only one expressing doubts. Respected experts in the field of military weapons, including at least one former UN weapons inspector, are raising questions about the US narrative of the attack. So are some members of the US intelligence community, according to the investigative journalist Robert Parry. The Syrian government has admitted to bombing the village, but claimed that the poisonous gas may well have come from a rebel supply stored there. We do know that both sides in the war have used chemical weapons. The Obama administration believed that Assad was guilty of the far worse gas attack on Ghouta in 2013. But even there, responsible analysts, including former United Nations investigators, have raised doubts around US government claims about what geographic area the rockets originated from. After Gabbard expressed her doubts and in the face of growing questions about the attack, the administration declassified a brief intelligence report to bolster its assertion that Syria was responsible. The report stated that US intelligence tracked the plane that did the bombing. It claims to have seen Syrian units experienced in chemical weapons at the base before hand. It cited credible independent groups concluding that nerve gas was used, and Amnesty International reported evidence that pointed to an air-launched chemical attack. Massachusetts Institute of Technology professor Theodore Postol has aggressively questioned many of these claims, however. An independent investigation is still needed, but surely Gabbard’s skepticism was not only defensible but laudable at a time when the media was blaring patriotic support for another military attack in the Middle East. Gabbard isn’t going to lose her seat because of Tanden and Dean’s tweets. Her opposition to escalating the wars in the Middle East enjoys wide popular support. But the calls for her ouster are instructive in any case. For all the urgent pleas for unity in the face of Trump, the party establishment has always made it clear that they mean unity under their banner. That’s why they mobilized to keep the leader of the Congressional Progressive Caucus, Representative Keith Ellison, from becoming head of the DNC. It’s why the knives are still out for Sanders and those who supported him. It’s why the DCCC still is loath to contribute resources and energy to populist challengers like James Thompson in Kansas, who threaten to build the Sanders/Warren wing of the party. 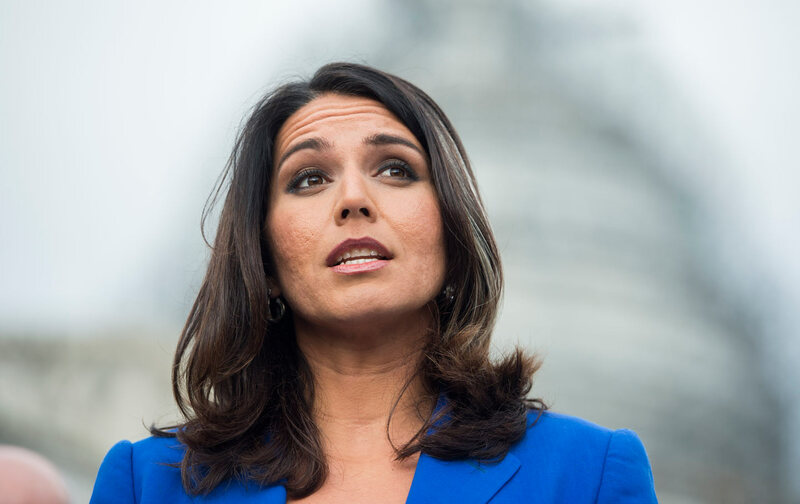 Gabbard earned Tanden and Dean’s enmity when she resigned as deputy chair of the Democratic National Committee in 2016 in order to endorse Bernie Sanders, warning that a Clinton victory would mean further futile interventions in the Middle East chaos. The attack on Gabbard from two ardent Clinton supporters should not surprise us. Tanden and Dean walk in the footsteps of those who would have read Republican Senator Wayne Morse and Democratic Senator Ernest Gruening out of the Congress for providing the only votes against the Tonkin Gulf Resolution, or censored William Fulbright for leading the indictment of the Johnson Administration’s Vietnam lies and myths. Would they banish the 21 Democratic Senators who got it right when they doubted the distorted intelligence that claimed to prove Iraq had weapons of mass destruction, and voted against Bush’s catastrophic war of choice on that country? Neither Tanden nor Dean is a foreign-policy expert; both made careers in domestic policy. Neither knows as much about Middle East wars as Tulsi Gabbard, a major in the Army National Guard who served two tours of duty in Iraq. Gabbard earned a Combat Medical Badge, an Army Commendation Medal with Oak Leaf Cluster, and a Meritorious Service Medal, among other honors. Like many who saw the human costs of the calamity up close, she became an ardent opponent of the war. She now serves on both the House Foreign Relations and Armed Services Committees. Tanden was domestic-policy adviser to Hillary Clinton in the Senate and during her first presidential run, and ardent advocate in her second campaign. Dean was also a Clinton supporter. They would like to oust Gabbard for expressing skepticism about the basis for a military strike, yet supported a candidate who got snookered by the lies and distorted intelligence of the Bush administration and voted for the worst foreign-policy debacle since Vietnam. Later, as secretary of state, Clinton championed the “humanitarian” intervention into Libya as a model of “smart power,” hoping to claim it as exemplary of a “Clinton doctrine,” before Libya disintegrated into a violent, failed state and a staging base for terrorists. Democrats are in the midst of a major struggle to decide what they stand for and who they represent. Part of that is the debate over a bipartisan interventionist foreign policy that has so abjectly failed. In her short time in Congress, Gabbard has established herself as a leading critic of that policy. The harsh attack on her is simply an attempt to enforce the boundaries of conventional wisdom. Gabbard deserves applause and support for questioning those boundaries in the cause of peace.